I like knowing what has gone into my food and I like making homemade treats, especially to take to a dinner party or to give as a gift. We all live with so much ‘stuff’ these days and don’t reeeally need more, but I don’t know anyone who wouldn’t appreciate a gorgeous edible gift, like a pretty box of these soft almond biscuits, especially when they are so delicious! They are also super simple and quick to make. 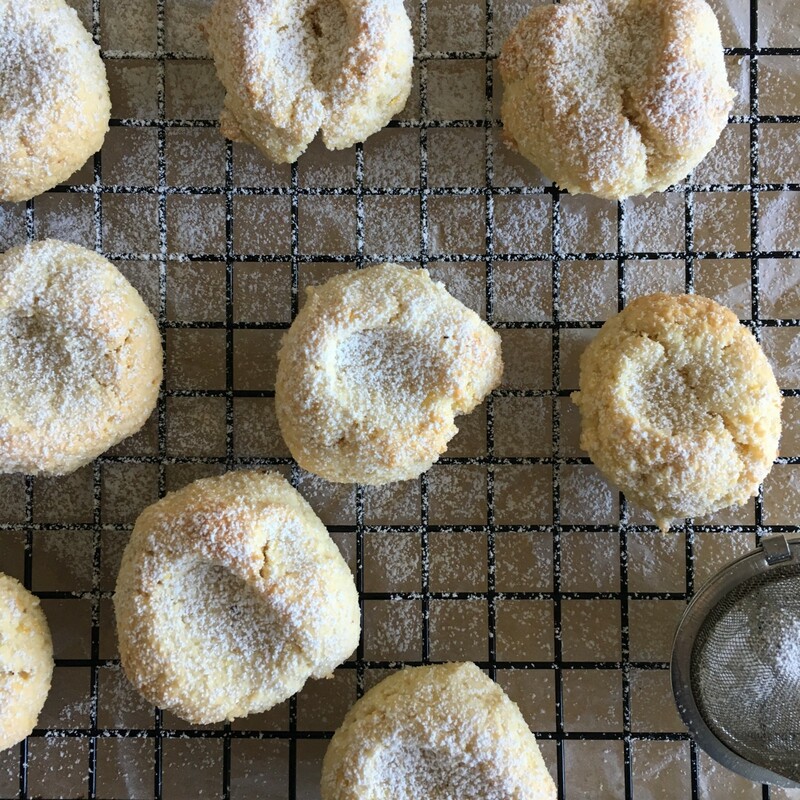 I first made these soft almond biscuits for my mum’s birthday. I wanted a treat that wouldn’t feel too heavy after a big Sunday lunch, and she can’t eat chocolate, so I thought I would experiment with something different. I am a little obsessed with using ground almonds. They help keep cakes moist, give an incredible flavour, and have a lovely texture. I’ve tried making my own marzipan and a frangipane cake both of which have become firm favourites! It is also handy to have a few gluten free recipes up my sleeve as I’m surrounded by more and more people who are intolerant (to gluten, that is). But mainly, if I honest about why I tried these out, it was Sunday morning, my parents were arriving at 12, and I had about an hour to make something nice for my mum!! These turned out particularly well, and everyone loved them — I have even since made them to give as Christmas gifts. I used a great recipe by Rachel Roddy to make these, and this is my version of it. But there are lots of variations you can experiment with, as I discovered in my gorgeous ‘Southern Italian Desserts’ cookbook (great Christmas prezzie for foodies…). These soft almond biscuits, or ‘pasticcini di mandorla’, originate from Sicily. The original is just dusted with icing sugar, but you can also pop in a whole almond, glacé cherry or piece of candied peel just before baking — this will make it look really pretty! 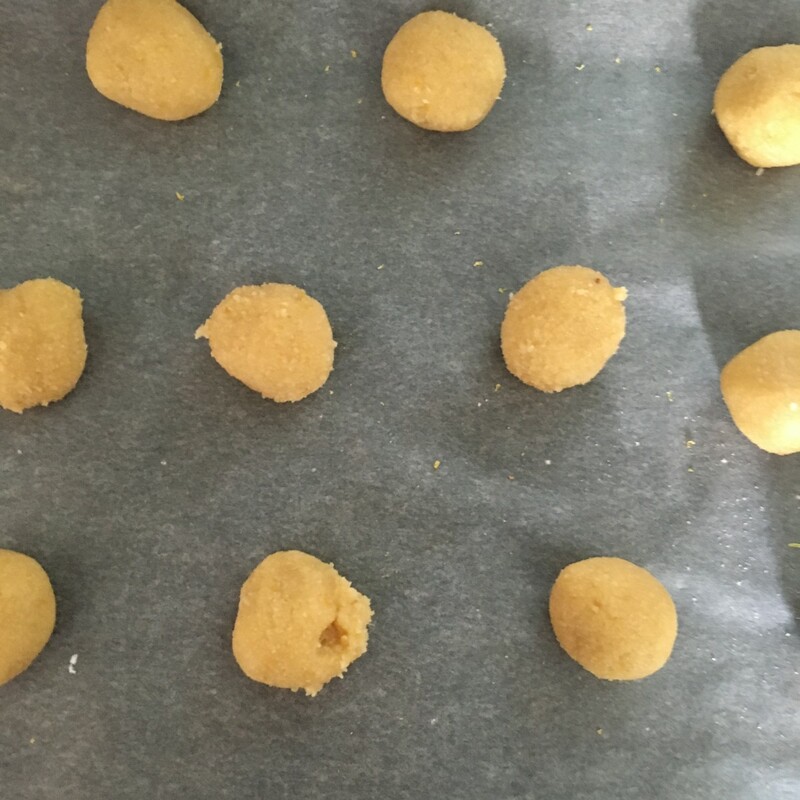 Alternatively, you can roll them in chopped nuts (eg pistachios, if you want to stay really Sicilian, or maybe hazelnuts) before baking — press firmly so they stick when you are rolling them. If you don’t have a lemon handy, try orange zest instead. Add a splash of amaretto, or a few drops of almond extract to intensify the flavour — though pop in a little extra icing sugar if you add any liquid. You get the point, there are endless possibilities. Experiment and enjoy! You only need 4 ingredients to make these lovely soft and chewy biscuits, and you can have them finished them in a grand total of 15 minutes. They are pretty foolproof, and delightfully hands-on, so if you have little ones who want to get involved, it’s perfect! 1. Pre-heat the oven to 180C/160C fan. Line a baking tray with baking paper. 2. 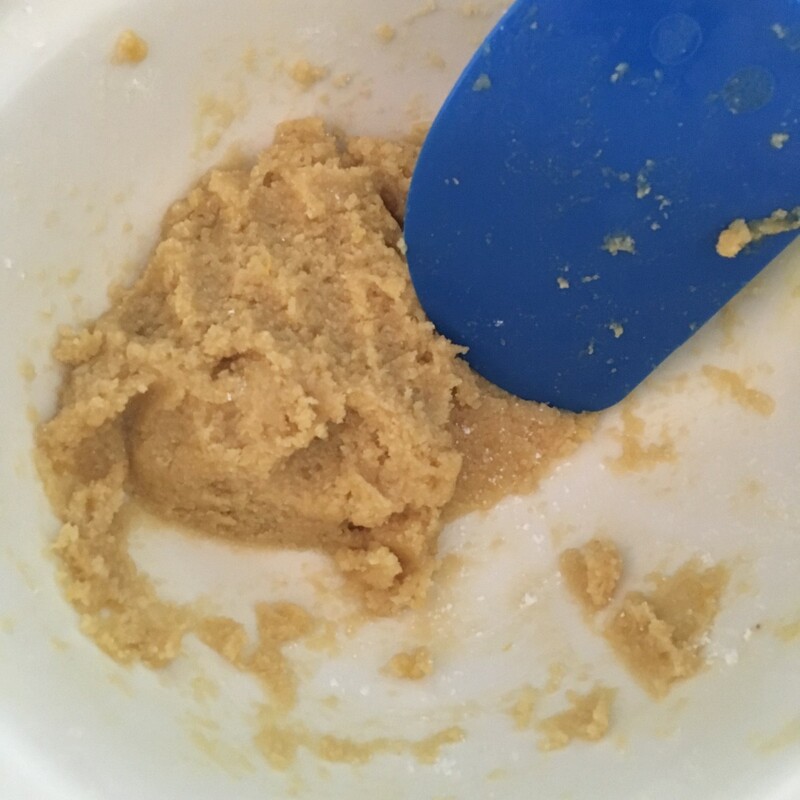 Put all your ingredients in a large mixing bowl and combine until it all comes together and forms a sticky dough. 3. Dust your hands with icing sugar. Take about a teaspoon’s worth of dough and roll it in your hands until you have a little ball. Place this on the baking paper, and press down in the middle to form a little indentation. 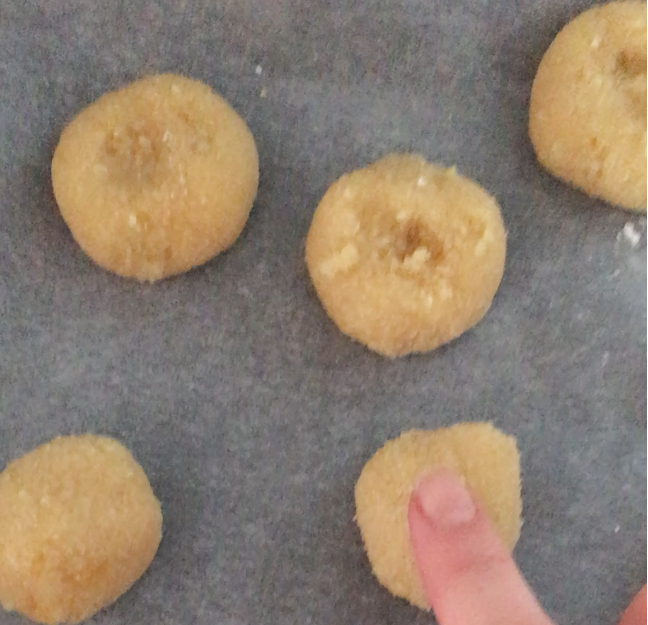 Keep going until you have used up all the dough, dusting your hands with icing sugar every time. You can add an almond to the top of the dough if you like, or even a glacé cherry! 4. Bake for 10–12 minutes until lightly golden. Leave to cool on a wire rack, and dust with icing sugar before serving. They will keep for a few weeks in an airtight container, but I doubt they will last that long! I hope you give these a try one day, and let me know if you come up with any more variations or have any other delicious gluten free recipes to try out!